Lamb yardings had a massive jump this week, while the majority was in NSW, Victorian producers also sent plenty of numbers in. Prices held on this week, but can it continue? It was a rather extraordinary week for lamb supply at saleyards. In NSW lamb prices not only hit a record, but were 28.5% higher than the previous record, at 194,781 head. 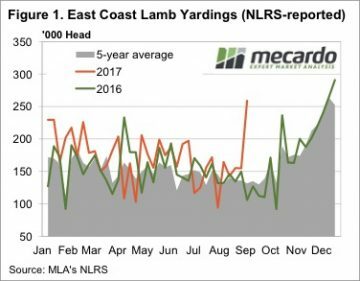 Lamb yardings in Victoria more than doubled, pushing East Coast yardings to a 67.5% rise for the week. East Coast yardings weren’t a record (figure 1), but were at levels normally seen during the early summer lamb flush from Victoria. East Coast yardings have never been higher at this time of year however. Interestingly the big yards of Wagga and Dubbo actually saw lower lamb numbers this week. Forbes and Griffith both had increases of 25-30% with smaller yards contributing a proportion of the increase in numbers. The impact of the heavy yarding on price was not a depressing as could be expected. 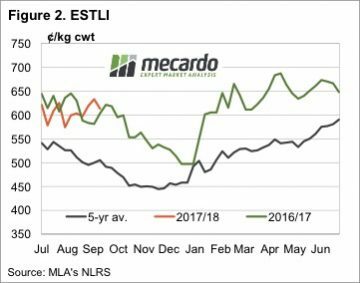 Figure 2 shows the Eastern States Trade Lamb Indicator (ESTLI) falling 12¢ to remain at the very strong level of 613¢/kg cwt. Unsurprisingly, NSW saw the heaviest price falls, with Restocker, Light and Trade Lambs all losing 4-7%. Heavy lambs in NSW remained relatively steady, suggesting the stronger yardings were mostly in the lighter categories. This is not surprising, as most of NSW has seen no rain in the last week, following a drier than normal August across large sheep areas in northern NSW. It’s hard to see lamb supply maintaining the extraordinary levels of this week, but we don’t expect a fall in yardings to do much to price. New season lambs are now flowing fairly steadily, with the only question being over the weight of lambs. This could see heavy and trade lambs hold their ground to an extent, in the face of easing light and restocker lamb prices.